We are grateful to Dr. Santiago Alcolea of the Institut Amatller, Barcelona for confirming the attribution on the basis of transparencies, and for his assistance in cataloguing this work. Previously grouped together under the name of the 'Almudévar Master' the identification of this hand with that of Juan de la Abadía, was made by Ricardo del Arco who discovered his name in a contract of 1491, in which the artist was employed to execute a now lost altarpiece of Saint Barbara for the Iglesia de la Mártires at Huesca. As a result of this, C.R. Post reassigned all the works previously given to the 'Almudévar Master' to de la Abadía (A History of Spanish Painting, Cambridge, Mass., 1947, p. 892). 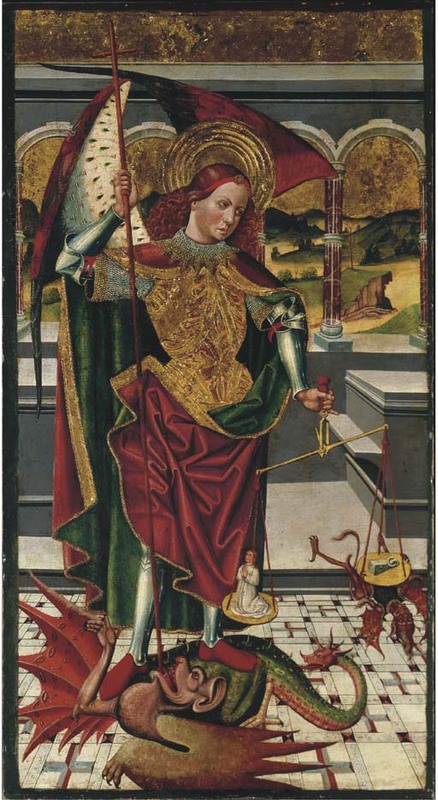 The figure of Saint Michael in this picture can be closely compared with at least three others by the artist: the Saint Michael as Weigher of Souls now in the Museo Nacional d'Art de Catalunya, Barcelona (see C.R. Post, A History of Spanish Painting, VIII, 1941, p. 452, fig. 209); the Saint Michael killing the Devil in the Museo Lázaro Galdiano, Madrid (see the catalogue of the exhibition La Pintura gótica en la Corona de Aragona, Museo e Instituto de Humanidades Camon Aznar, Zaragoza, 21 October-10 December 1980) and finally the Saint Michael in the Saints Michael and Engracia offered in these Rooms, 9 April 1990, lot 56 (see C.R. Post, op. cit., pp. 452 and 455, fig. 210).